Established in 1846, Copper Falls mine was a collection of several copper mine shafts and adits (definition below). Owl Creek — in what was once one of the richest fissure veins in the Keweenaw — seems to make a magical (and a seasonal) appearance out of a hillside draining the now closed Copper Falls mine to form this quite spectacular and scenic-looking Copper Adit Falls. 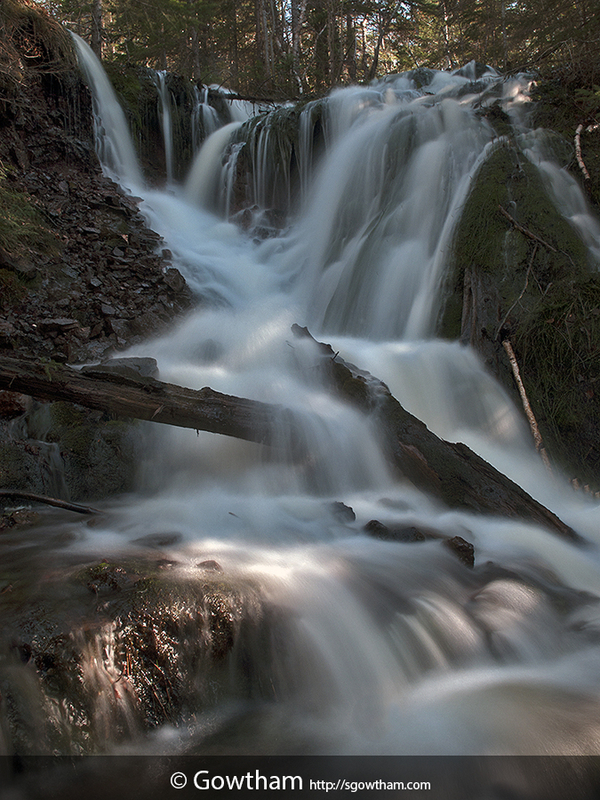 With the nearby remnants of an old stamp mill, this waterfall is also known as Stamp Mill Falls. Citing Wikipedia, an adit is an entrance to an underground mine which is horizontal or nearly horizontal, by which the mine can be entered, drained of water, ventilated, and minerals extracted at the lowest convenient level. Mr. Fred Geis for being kind enough to describe the rich history of Copper Falls Mine and then grant me unsought permission to hike through his relative’s property for a relatively easier access to this waterfall.